FORT LEONARD WOOD, Mo. 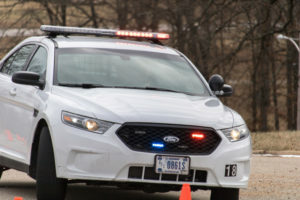 (Feb. 7, 2019) — The U.S. Army Military Police School at Fort Leonard Wood held the high-speed, evasive driving portion of its third Emergency Vehicle Operator Course Jan. 31 at the Basic Military Police Training Division. Spc. Megan Wells drives the course at full “run” speed, 35 mph. Photo by Sam Campbell.